Kathy Crenshaw UMTC in 7 weeks! Kathy Crenshaw is a passionate music teacher who loves to teach and also has a special place in her heart for her favorite pink piano. I had the pleasure of meeting Kathy in Texas as I presented the Ultimate Music Theory Workshop. 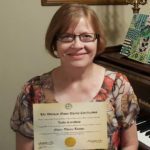 How did Kathy Crenshaw go from attending a Texas music teacher's workshop to massive success in the Ultimate Music Theory Certification Course in just 7 weeks? It's quite an amazing story and I'm so happy she shared it with us! Join me in congratulating Kathy Crenshaw UMTC as she shares her story of success as she discovered the Ultimate Music Theory Program. And Always Remember… Teach with Passion and have Fun Learning! I went to a workshop for Ultimate Music Theory on June 20th to get my continuing education point for my Music Teacher Association. I had resolved not to buy anything. As I listened to Glory explain her theory books and how they worked, I became more and more intrigued with how the concepts were presented, the memory joggers that she talked about and the FUN that I could have with my students. Just the week before, I had a student sitting on my bench at the piano crying as I was explaining her theory lesson to her. I asked her why she was so distressed, and she just shrugged her shoulders. I remember thinking that theory should not make a student so distressed that they cry. So, the Ultimate Music Theory seemed like the perfect solution. The more Glory talked, the more I realized this is what I needed to help me look at theory in a different way and find new and fun ways to present the concepts. So, I signed up for the Ultimate Music Theory Certification Course for teachers. When I start something, I go all in. I signed up for the online course to get my certification. I bought all the levels of books, the teacher answer books, the big whiteboard and the small whiteboard. I was scared, but was all in. It was a big investment during the summer when I was very low on students. I started the Basic course the next day. I bought some pretty binders, some dividers, printed all the materials and started the videos. About half way through the Basic book, I decided that if I worked through all the pages, I would understand better what my students were going to be asked to do. So, not only did I do the pages talked about in the video and the review tests, but every single page in the book! My favorite part of the Basic Book was the Melody Motel and Harmony Hotel. I also loved the Stem Rule Song and the Accidental Salute! Finally, it was time for my test. I printed out my test, got some cookies, Sunkist orange soda and some popcorn. (That's the fun part of learning online - study snacks!) It took me about 2 hours to do my first test and to look over everything. I made a 97!! Yea me! Kathy Crenshaw - On to Intermediate! Then it was ti me to turn to the Intermediate book. I printed all my pages, put my dividers between each lesson and was ready. I listened to the videos and did all the pages, just as in the Basic book. It was in this book that I really found the benefit of the “Karate Chop” method. I’m so glad that I kept doing it even though it felt funny in the Basic Book. It is a wonderful tool to give to the students! I even created a "Theory Zone!" Beware of fun learning! I finished the Intermediate workbook, took my test and made a 98.5!! I was very proud! Just one more to go - on to the Advanced book! Kathy Crenshaw - The Advanced Book and the UMT Theory App! I bought the Ultimate Music Theory App as I started the Advanced book. It really helped me learn the terms that I needed to pass my test. It is such a fun way to learn! I learned so much in the Advanced book. The modes became as easy as the Major and minor scales are to me. Glory explains everything in such a simple way that it made me wonder why I had never thought of it that way. I relearned the Alto and Tenor clefs that I had long forgotten. I learned how to draw 7th chord inversions with the notes drawn correctly. In fact, I got the 7th chord inversions all correctly drawn on my test. So proud! I made a 96.5 on my Advanced level test! YEA!!! 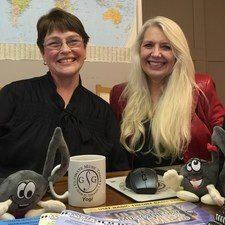 (L - R) Shelagh McKibbon-U'Ren UMT Examiner and Glory St. Germain UMTC Course Creator and Teacher, have designed an amazing online teacher training program including online support! Shelagh was such a constant help. Every time I emailed her a question, she got right back to me. And she was so encouraging along the way. I am very excited to start Ultimate Music Theory Club classes with my students. The ones not doing classes will still do the Ultimate Music Theory books, but just one-on-one with me at their private piano lessons. 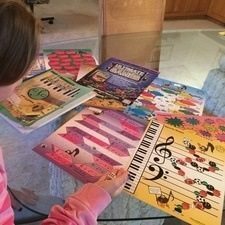 Every concept from the Ultimate Music Theory books that I have already used with students has helped them learn something new about theory and their eyes light up! I’ve used the Preparatory Games and the Basic Games over and over. They all love using the whiteboards too, especially ME! I worked really hard and finished all 3 books, all 51 videos and the 3 tests in 7 weeks! Whew, my brain was on theory overload! But I wanted to finish so that I could start my classes and the new books will all the wonderful information at the start of the new school year. One of the best things about these books is that they directly relate the theory learned to the music. In the past it seems like my student thought they had theory homework to do and pieces to work on without relating them to each other. Now they will learn that the theory concepts they learn apply directly to the piece they are learning to play. Almost every lesson has a piece to analyze and find the concepts they just learned! How great is that! Kathy Crenshaw - Ultimate Music Theory Certified Teacher! I am very enthused again about teaching theory. I’ve learned so much about how to teach each student in their own learning style. I’m looking forward to fun-filled year! Thank you Glory and Shelagh! I highly recommend the professional development in the Ultimate Music Theory Certification Course.